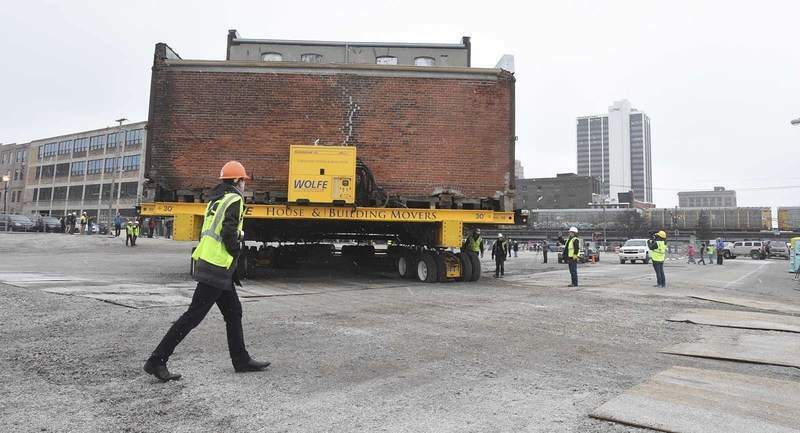 Metal sheets were placed under the wheels as the 122-year-old building was slowly moved southeast from its South Harrison Street location to a vacant lot on West Superior Street. The Cambray and Associates building moves into a temporary locations from the site of Promenade Park , 312 S. Harrison St., to a vacant lot across the street, Monday, January 29, 2018. 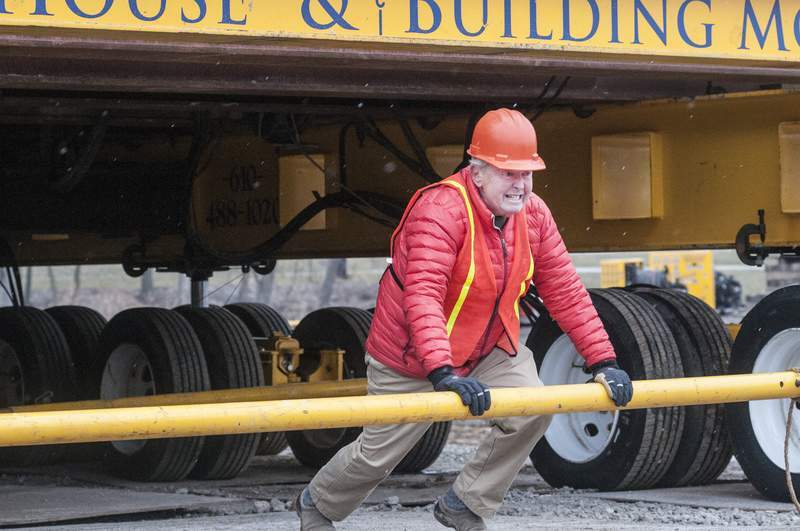 Bud Hall, co-owner of Hall’s restaurants, playfully attempts to move the structure Monday. The Hall family bought the building in December but is not sure what they will do with it, though it could become a restaurant. The Cambray and Associates building was moved from the site of Promenade Park , 312 S. Harrison St., to a vacant lot across the street, Monday, January 29, 2018. 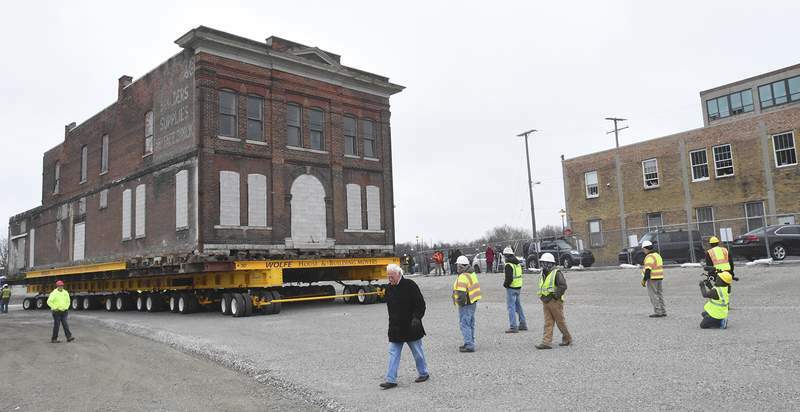 Bud Hall receives a little help in moving The Cambray and Associates building from the site of Promenade Park , 312 S. Harrison St., to a vacant lot across the street, Monday, January 29, 2018. Actually the building was moving on its own. The former Cambray & Associates building needed to be moved to proceed with work on Promenade Park, part of the city's downtown riverfront project. 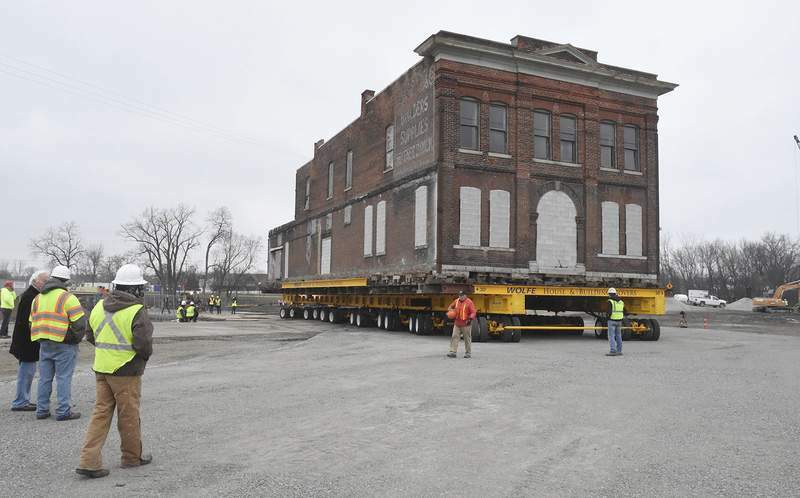 It's not every day you see a 122-year-old building move. With snowflakes falling and wind whipping through the site at 312 S. Harrison St., crews moved the former Cambray & Associates building southeast to a vacant lot on West Superior Street. The red brick structure rolled slowly atop yellow steel beams with dozens of wheels underneath. “It's pretty exciting,” said Derek Mauger, who watched with wife, Olivia, and their son Arlo, 3. The new location is a temporary spot for the building, which was sold to Hall's in December for $2,750 and land the company owns north of the St. Marys River. It eventually will be moved across the street to a space that now includes a county-owned parking lot on the south side of West Superior Street. That move could happen in the spring, said Bud Hall, part owner of the eponymous local restaurant chain. The city of Fort Wayne used eminent domain last year to obtain the Smurfit building – which has been demolished – and the Cambray building. Both needed to be moved to make way for the planned Promenade Park, part of the riverfront project. The building's next move, to its permanent location, will be necessary because the temporary location at 124 W. Superior St. includes the planned $61.7 million Riverview complex. Hall said Monday plans for the building are not clear, though it could become a restaurant. He said he and his family jumped at the chance to buy the Cambray building to save it. “We hate to see a solid old building sent to the dump,” Hall said. 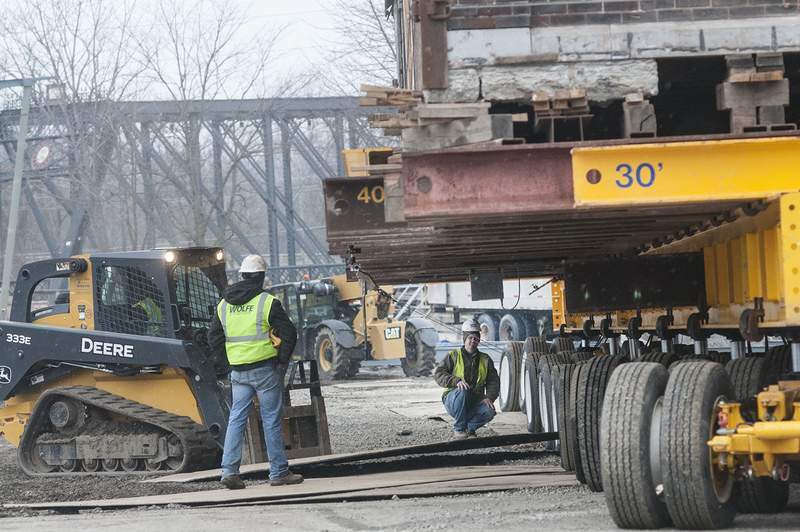 Andrew Heck, vice president of Wolfe House and Building Movers, said his Bernville, Pennsylvania, company has worked for about three weeks to plan the move and raise the building onto the beams. “It's actually in really good shape,” he said. Wolfe also has an office in North Manchester. Work on Promenade Park is already underway, and a pavilion is being constructed. With the Cambray building no longer in the space, city Parks and Recreation Department Deputy Director Steve McDaniel said, work will begin in the next few days to further develop the land. “We are moving in right behind it to develop the area,” he said. The project is part of ongoing work for the downtown riverfront development project.